I purchased Wheatstone #54769 (30 key C/G Anglo) about 3 years ago. I took it in for repair recently and the technician didn't recognize the inside of it. I queried the seller and they said it had undergone the "South Africa treatment" before they got it. I know this has been an occasional topic of conversation on these forums (https://www.concertina.net/forums/index.php?/topic/5043-opinions-on-this-wheatstone-anglo/), and I've found some other discussions as well - http://www.concertina.com/gaskins/late-wheatstone-anglos/index.htm, https://thesession.org/discussions/13881. The gist of it is that from 1938-1974, Anglo Wheatstones were manufactured in South Africa with numbers in the 5XXXX series. They're somewhat different from the original Wheatstone design. None of those seemed to address what the repair tech said, which was, "It is clear that your reed pan construction is nothing like original Wheatstone production, with tear-drop shape brass reeds, that slide into the segmented pan. This one looks more like a Lachenal (or other) pan covered by remaining Wheatstone end plates. Possibly explained by difficulty (after Wheatstone's death) in constructing the pan and in accessing original reeds. I'm disappointed by the application of "Wheatstone" on this modified version, not to mention its African modifications using 'accordion-type' reeds." Does anyone have experience with South Africa Wheatstones? Do the tech's observations describe a typical South Africa Wheatstone? I bought an 80 key Maccann Duet from South Africa last year. The only difference in the reed frames during later years of production was that they were made of aluminium rather than brass and the reeds were of the traditional type. Mine was made in 1956. Can you post a photo of the reed pan? The gist of it is that from 1938-1974, Anglo Wheatstones were manufactured in South Africa with numbers in the 5XXXX series. They're somewhat different from the original Wheatstone design. To my knowledge the Wheatstones out of S. Africa were imported from the UK and from the Wheatstone factory. After WWII Wheatstone apparently sought to stay economically competitive with the times by trying a number of labor saving innovations departing from traditional reed and reed pan arrangement. These included screwed down rectangular frames and, from a repairman's view, the infamous post and spring clip way of mounting reeds. The dozens of examples I've seen and worked on indicate the Africaners were not shy about modifying their instruments (No doubt in the interest of keeping them playing sometimes in rural and isolated environments.) Few can doubt their love and embrace of the instrument but concertinas from that part of the world come with the caveat that they may not be originally intact. Here's the reed pan. I believe mine is a 1954. Uploading a higher resolution photo. 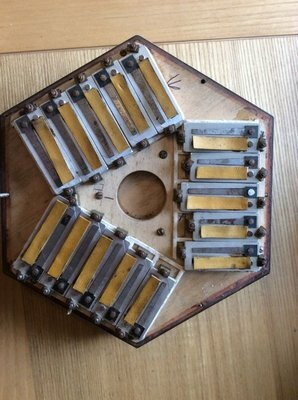 Picture shows original Wheatstone construction with screwed down aluminum frames. Please note that after 1934 Wheatstone by and large abandoned rivet action and went to a "hook and arm action. Wheatstone's used a different kind of pivot than Lachenal. Should be no confusing the two. the repair tech said, which was, "It is clear that your reed pan construction is nothing like original Wheatstone production, with tear-drop shape brass reeds, that slide into the segmented pan. This one looks more like a Lachenal (or other) pan covered by remaining Wheatstone end plates. Post WWII Wheatstone anglos will sometimes have the typical vintage treatment of reed frames fitted to dovetailed slots with either aluminum (most common) or brass reed frames. (Occasionally the aluminum and brass frames are mixed with the brass frames used for the higher notes) Some have the screwed down rectangular aluminum frames. (As in your picture) Others may have an arrangement of post and spring clip affixing the aluminum frames to the pan. My first anglo had screwed down reeds. It played well without problems. Thanks, Greg. Glad to know it's legit. Truth be told, though, I'm anxiously awaiting the Wally Carroll instrument I ordered, which should be ready around the end of the year. I played a few at Noel Hill's school last summer, and I know it's going to be a lot more responsive than the Wheatstone. Good for you! (I worked with Carroll Concertinas for a number of years.) Wally builds an excellent instrument inspired by the vintage Wheatstone Linotas. You will be in "concertina heaven" when it arrives. What interests me is that, apart from the one reed at the top which has the traditional screwed clamp, the rest seem to be crimped into their frames. Presumably a cost-saving measure. That is a photo of the Wheatstone "Mayfair" reed board. That's an interesting discussion. Did I understand correctly that May Fair instruments were made by Wheatstone's but sold under a different name? This instrument has a Wheatstone plate on it. I also read in that discussion that the value of a Mayfair is relatively low (maybe $600 15 years ago). 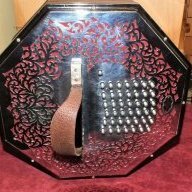 I'm curious about this because I'm ultimately planning to sell it once my new concertina arrives, probably toward the end of the year. I bought it from the Button Box in 2014 for about $2,300, and while I've never visited the shop in person, they seem to be well-respected in the forums, and my impression is that they value things fairly. I agree that. FYI here is a photo of Mayfair anglo's reed board from ebay. Mayfair used accordion style reeds (a pair of reeds on one plate and on the one side of the reed board), it was quite different to OP's reedpan (single reed per plate, reeds were on both side of the reedpan). Here's the left hand side of my Wheatstone 57407 complete with the Wheatstone metal badge saying Made in England. You can see that the reeds are conventionally shaped but in aluminium shoes. There is a label inside which says Vervaardig dear: Wimple Croukamp 012 3794601. I'm told this is a repairer in South Africa. I don't know if the black leather seal is original. 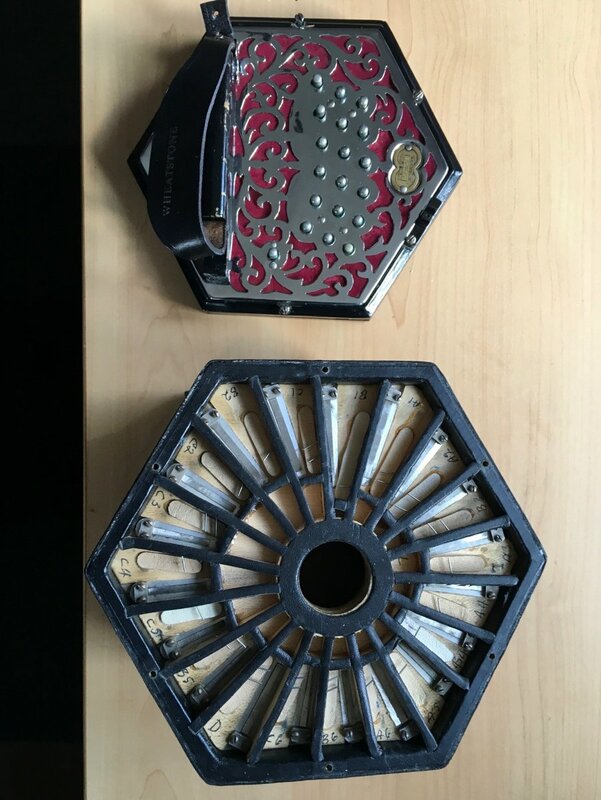 It looks like the same material as the 8-fold bellows which may well have been replaced. All in all, quite a decent instrument and very light weight. Several years ago, shortly after I had bought a very nice Wheatstone 40-key C-G from Chris Algar, a Koot Brits (South African) 40-key C-G came up on eBay at a much lower price than the Wheatstone and I thought I might as well have that too, then eventually sell one or the other. When it arrived I immediately recognised some faults, notably that it uses much more air than the Wheatstone for the same amount of sound. I decided to seek Steve Dickinson's advice, but eventually visited him only last Thursday, the same day this thread started. Steve confirmed my supposition that the reeds have too large air gaps and pointed out several other faults including solid pads rather than having felt cushioning. He believes that it is basically a 1950s Wheatstone model either rebuilt in South Africa or built new from some Wheatstone components with re-used Wheatstone and Lachenal reeds. 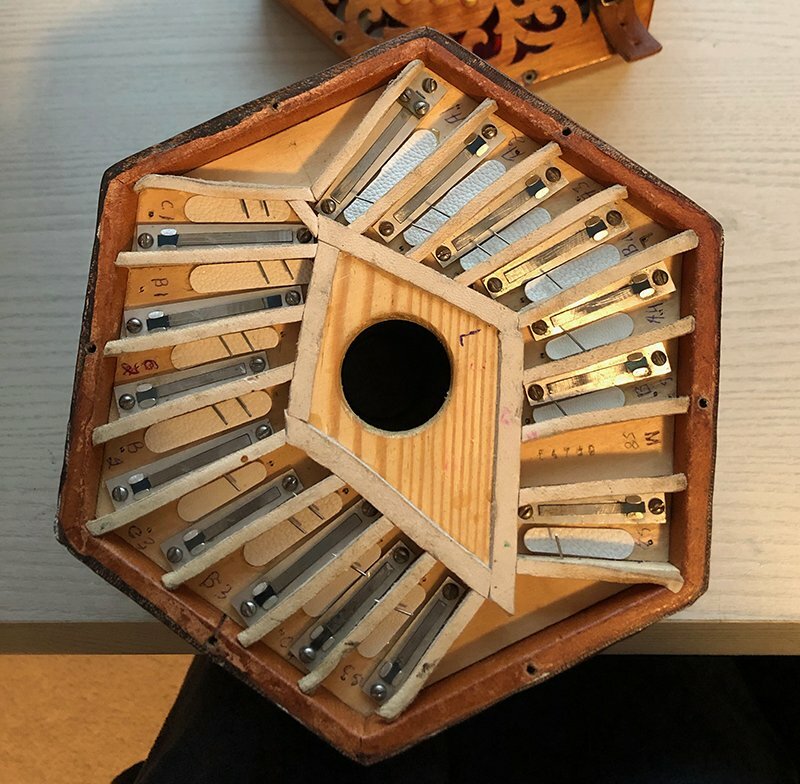 It is mostly playable as it stands, and would be perfectly playable with a modicum of work, but it would need a total rebuild to turn it into a good instrument. It is big: 12-sided and 7" / 180 mm across the flats. I am now wondering what to do with it. Essentially the options are to sell it as is or maybe to pay someone to do a bit of work on it first.